The picture below is an un-edited photo of the sun near our apartment last Tuesday evening -- around 6 p.m. While it makes a rather pretty sky picture, the reason is not at all good because the dramatic tones are due to smoke from wildfires... and it has severely socked in our valley. According to an article in our local paper (The Register-Guard, Thursday, August 31), wildfires in Oregon are burning an area equivalent to half the State of Rhode Island, affecting air quality throughout the state. There are two dozen fires in southern, eastern, and central parts of the state that have scorched a total of 571 square miles. Because of the bad air quality, we have done no playing outside this week -- the rest of today's pictures are 'look-backs' and memories. Our weather/climate problems are of course as nothing compared to last week's devastating hurricane and unending heavy rains on the Texas and Louisiana Gulf Coast. Damages are horrendous and the aftermath continues. We stayed twice in Port Aransas and once in Fulton/Rockport, where Hurricane Harvey first made landfall. 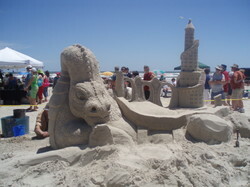 (The coastal towns are on opposite shores of North Padre Island, near Corpus Christie.) From what we have seen and read, it looks as if both are completely devastated and will take years to rebuild. As full-time RVers, whenever we stayed in an area for three or four months, we always considered ourselves to be residents. Of course, it isn't the same as it is for people who have spent their whole lives in an area, but it was long enough that we would felt at home and get to know the community far better than one would just passing through. North Padre was one of our all-time favorite areas and we have wonderful memories of both towns. Travel certainly taught us a lot about our country and brought much joy -- but it also makes losses such as the one from this horrible storm more vivid as we recognize places being destroyed and remember them and the people we met. Our thoughts are with all those in the affected area. Many years ago on a camping trip Bill showed me evidence of the way shrikes impale their prey, and I probably saw the bird too -- but that was long before I became really interested in birding -- so I'm definitely calling this sighting a first. The flowers below came from a walk around town that we took when my sister and brother-in-law were visiting last week (after Eclipse Day)... they're part of a wall of hanging baskets in front of a Nursery. We are hoping for more dramatic flowers and fewer dramatic smoky skies in September. LINKING THIS WEEK TO: SATURDAY CRITTERS; OUR WORLD on Tuesday; MOSAIC MONDAY; NATURE NOTES; THROUGH MY LENS; FLORAL BLISS; WILD BIRD WEDNESDAY; and SKYWATCH FRIDAY. This look back at a stop on our recently-completed roadtrip is linked to SKYWATCH FRIDAY. We were in Fredericksburg Texas over Thanksgiving weekend, when the town celebrated the beginning of the holiday season. but the charming decorations were enough to put us in a holiday spirit. We loved this giant version of a traditional German Christmas pyramid. Fredericksburg was founded in 1846 by a small group of settlers from Germany and retains much of its heritage. Lots of good German food and a bustling historical district. Here is the Wiki-link to an article about the City. This wasn't our first visit, since in our earlier full-timing days we spent several winter seasons in Texas. There is a lot to do and see in Fredericksburg and, based on the crowds on the days after the Holiday, pretty much everybody in this part of Texas was there to do it. The town is definitely worth a stop if you're in the area. "ISLAND TIME STARTS HERE" says the sign on an inn near our RV Park in Port Aransas. Time is different in Port A. Now that we've left, it's hard to say exactly what we really did there for two months, but we do know we enjoyed every minute of it. The town of Port A is about 10 blocks square. Our park was centrally located, so we walked all over (until the last week we were there, when it got too hot). This picture was taken at Paradise Pond, just off one of the town's main streets. 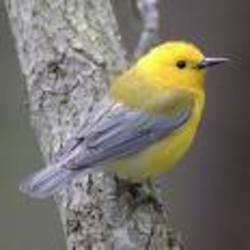 It is a world premier birding site during spring migration. 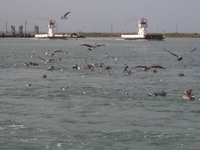 Port Aransas is on Mustang Island, connected by bridge to North Padre Island and then to the big city of Corpus Christi by bridge and causeway. We fell in love with Port A when we stayed there for a couple of months in 2000. Then, in 2006, after we spent the Winter in Tucson and the Big Bend country, we decided that we really needed to stay on the Coast again next time out, so we took a quick scouting trip around the Texas Coast before heading back to the Northwest. 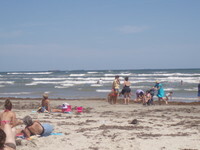 We looked at a lot of nice RV Parks in the Mission Valley area and on South Padre island. But North Padre still called our name. We ended up picking a spot in Fulton, which is just across the bay from Port A. We stayed there for four months in 2006-07. This winter, 2007-08, we moved around among several old-favorite places and we took some fun road trips in between. Our nearly two months at Port A was the longest stay of this season. After four visits, we still love this whole area and especially the little island. We had a good time last year in Fulton, but we needed a car more often. Being able to walk to more places is a definite plus for Port Aransas. Here's a re-cap of a few of our activities this time around. Aimless wandering, trying out several of the island's excellent restaurants, reading, daydreaming and other such island activities are not included. There was a kind of party at the beach one Saturday morning to celebrate the release of three sea turtles that had been in rehab. A couple of hundred of us were there with cameras. These two are loggerhead turtles. As soon as the rehab volunteers slid them onto the sand, they headed for home. They can smell the sea! That big one on the left is about 80 years old. Another variety of endangered sea turtle, called the Kemp-Ridley, lays its eggs on the Island and several nests have been found recently. We walked down to the dock to buy shrimp right off the boat, until the season ended in mid-May. The boat coming in is the Alicia Kayla. Click to see the crowd of birds following her into the dock. At the dock, the pelicans are waiting for small fish caught in the shrimp nets -- the deckhands throw them over. Easy fishing for them as well as for us! I had heard once that brown pelicans were somewhat rare -- this must not be true anymore. One day we went walking with the alligators at the Aransas Wildlife Refuge (across the bay and a favorite place from all of our stays). We saw a couple of mother gators with newborns. They were pretty darn cute, definitely proving the adage that all babies are adorable. At left of the first picture, you can see the babies in the water. In the second picture, Bill got a little closer for a better picture (about 10 feet away.) In the third picture, the mother lets him know that this photo-op is over! Here are two of the Port A car ferries that cross the ship channel between Port Aransas and Aransas Pass. The free ferries are maintained by the State Highway Department and run 24/7. Pretty often, we spot dolphins playing around the boats as we ride. Sometimes huge ships get the right-of-way. It was a beautiful weekend on the Texas Coastal Bend. On Saturday, we strolled to Roberts Park, next to the ferry landing, about 4 blocks from home. We hopped on a free shuttle (a school bus) to the beach. 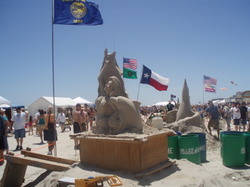 The annual Texas Sandfest was this weekend. We had debated whether to go on Saturday in order to watch the sculptors at work or wait until Sunday to see the finished creations -- and decided it was more fun to watch people work. After quite a long and sandy walk viewing the sculpture area, we were happy to find a covered music tent where we listened to a fun Austin-based blues band called JT Coldfire. What a great place for a concert. The dragon and castle was our favorite entry. 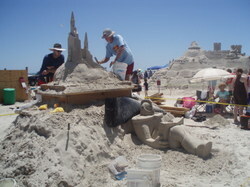 Sand artists come from all over to take part in the festival. The sand here is said to be ideal for sculpture. 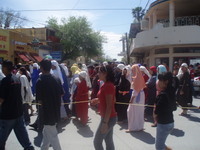 There is an internation circuit of similiar events. This entrant was from Portland, Oregon (see the state flag). Sponsoring businesses provide food and lodging for participants and prizes are awarded. Lots of people were here to enjoy the lovely day on the beach as well as to see the festival. The Sunday paper said that thousands of cars were lined up for the ferry. Much better to be on the right side of the landing already as we are! You can see the saragasso weed on the forebeach. 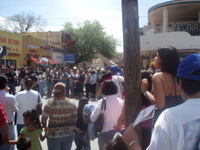 It comes in this time of year and creates some controversy between the tourist people and the environmentalists. It's needed for erosion control and bird habitat. Most people just rake it away from the spot where they want to relax. It was a great beach day. We had enjoyed visiting with the shuttle bus driver on our way. And when we came home, he wasn't very busy and delivered us right to our door. Nothing like having our own big yellow limousine ride. It would be fun someday to say we'd visited all of our National Parks. Even if we don't ever get to all of them, we are glad to have spent time in the most remote and least visited one in the lower 48 states. This is Big Bend in southwest Texas. There are 800,000 acres within the Park's boundaries. The scenery provides wonderful contrasts. 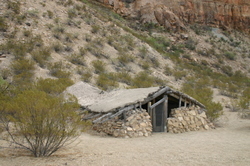 It is in the Chihuahuan Desert, surrounded by the Chisos Mountains. 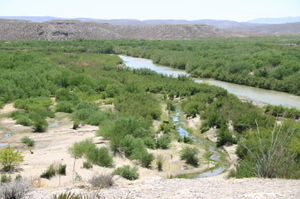 The Rio Grande River forms an international boundary along the south edge of the park (for 118 miles). The River is narrow and you can see Mexico on the other side. We really hope that by the time our grandchildren get to visit the park they will still be able to see this view instead of a fence or wall. 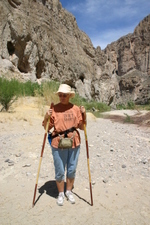 We hiked down the spectacular Boquillas Canyon. It's a narrow section formed by the River when it meandered through the desert eons ago. 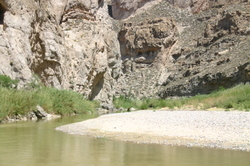 The river level was low when we were there and we easily explored the bottom of the canyon by foot. 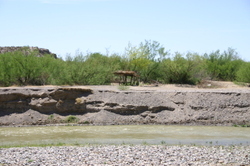 Before 9/11 there was a soft crossing here into the Mexican village of Boquillos Del Carmen. 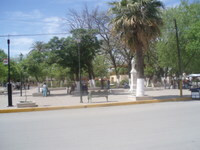 Tourists could be ferried across the river and experience a bit of what was like to live in a remote village in Mexico. That's no longer possible because of security concerns. By road, the village is 100 miles from the nearest legal crossing to the US, so these changes have almost completely cut off the village's source of income other than subsistance farming. While security is certainly a problem at some more metropolitan border cities (such as El Paso), it is hard to imagine how it could really be so serious way out here. Vendors still wade across when they can get away with it, keeping an eye out for Border Patrol. 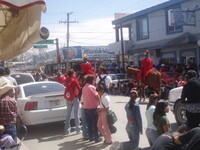 The stand shown here is on the Mexican side of the river. We purchased these walking sticks. 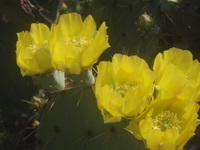 Made from stalks of the sotol plant which grows wild everywhere, they are light and quite strong. Humans have lived in the park area since prehistoric times. The little dwelling in the picture below is called Luna's Jacal. It is a rare remaining example of a building from the region's early settlement period. Luna was a Mexican sheepherder and he and his wife raised a large family (10 or 11 children) in this house. A jacal is a type of dwelling with upright posts chinked with mud. It had a thick mud roof that kept it cool in the desert heat. You can see that the roof is disintegrating. This points out a major problem with all national parks and especially this one, I suppose because it is so remote. There isn't enough funding and staff to keep up the archeological sites in the park or even to properly catalog all of the historic sites and structures. 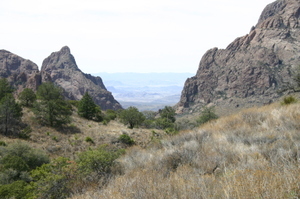 Big Bend Park is in Brewster County which is one of the most sparsely populated areas of our whole country. Only about 13,000 people live within its 6,000 plus square miles. We stayed in Alpine, which is 100 miles northwest of the park headquarters and then moved to the tiny village of Terlingua which is a gateway community to the park. These are both remote, quirky communities. We had fun exploring around the towns as well as within the park. In this picture, you can see our Texas home, where we were just a few steps to Aransas Bay. We liked this little park a lot and we loved the area. The RV Park is not too large and had activities that kept us busy with new friends when we were not out exploring the area. Pelicans and other water birds swam by every day. The picture on the right is the Water's Edge fishing dock. Fishing wasn't very good while we were there, but it was nice just to walk out and watch birds and occasionally dolphins. Fulton Harbor is within easy walking distance of Water's Edge. It's a working harbor, mostly for harvesting oysters (during the months we were there) and shrimp. We always enjoy watching other people work and oystering is fascinating. I wouldn't want to go out on the ocean in a boat like the one in the third picture, but it is typical. There will be a crew of three men and a pile of sacked oysters on the deck when it comes in. Then,the buyer will pay the boat's captain, and the sacks will be moved off to waiting reefer trucks to be transported back east. (But sometimes, the sacks stand around for quite a while in the warm weather--that kind of makes you worry.) The guy at the fish market told me that all of the oysters sold in restaurants on the east coast come from here. Would he lie? Moon Dog at the Harbor was our favorite "dive". More a local hangout than a tourist place, it served good, fresh seafood. It was very pleasant to sit out on the deck and watch the boats and water birds. Especially on a warm sunshiny winter day! 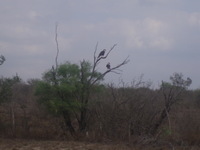 Our very favorite place to explore was the Aransas Wildlife Refuge. 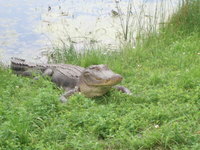 The volunteer at the Refuge Headquarters said that if we saw an alligator lying across the path, we should turn around and go back rather than attempt to step over it. (Like I needed that advice!) We didn't see any on the path, fortunately, but we saw a lot nearby. I wonder what this one was thinking. Armadillos are supposed to be very common, but this was the first one we'd been able to get close to. I think they are probably nocturnal (and we aren't). We took a tour boat out to the offshore islands to see one of the few remaining stands of Whooping Cranes. These birds are 6 feet tall -- there's nothing to compare them to out on these islands where they feed, so the pictures we have don't really get across how amazing they are in "person" . This turtle and bird pond is in Port Aransas on Mustang Island. 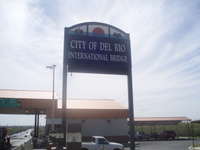 You get there by taking one of the car ferries which are operated by the Texas Highway Department. We love the Gulf Coast of Texas. It makes us smile too, just like this guy seems to be doing! !